I'm not a huge fan of diet cookbooks in general. Usually I find that some of the recipes are okay, but the overall diet isn't something I could live with, long-term. Or there will be a lot of substitutions that I don't care for. 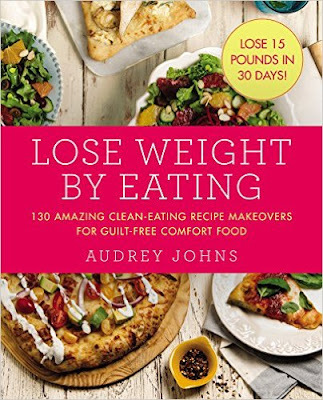 Lose Weight by Eating by Audrey Johns got my attention because of the title. It sounded like it might be different. The introduction talks about how the recipes are comfort food, but slimmed-down. I think that makes more sense than severe restrictions. So far so good. And then it talked about using real foods rather than processed. I'm all for that, too. Browsing through the book, the recipes were very similar to things I make all the time. More good news. One of the common substitutions was using turkey or chicken (or turkey or chicken sausage) instead of beef or pork. That works, too. And there were other recipes that used beef or pork. So it's not like you have to give them up entirely. The only slight quibble I had with ingredients was the use of 0-percent-fat Greek yogurt and nonfat cream cheese in some of the recipes. It's not that I don't like Greek yogurt, but I find that the 0-percent versions often have extra ingredients, like thickeners, that aren't in the higher-fat versions. If you're subbing yogurt for sour cream or mayonnaise, then 2-percent or even full-fat yogurt offers a significant decrease in fat, And if you're trying to eat least-processed foods, then 2-percent or full-fat are probably a better bet. As far as fat-free cream cheese ... well, I've tried it, but I just don't like it. But my personal dislikes aren't a reason to avoid the book or the recipes. It's pretty simple to swap those ingredients, just like you could swap parsley for cilantro, if you wanted to. And of course some folks like the no-fat versions of yogurt and cream cheese - I'm just talking about my personal opinion. As far as recipes, you'll find everything from breakfast to bread and from sandwiches to soup. And desserts and drinks, too. You certainly won't feel deprived! I have to be honest and say that I probably won't launch myself into this diet, but I have bookmarked a few recipes, like the pesto chicken sandwich, stuffed shells, cilantro rice, stuffed baked potatoes, and salsa rice and chicken bake. While the point of the book is to follow the diet, the book would also be handy for added some slimmed-down recipes to your repertoire. Like the barbecue turkey meatloaf instead of regular meatloaf. I'm definitely going to try that one, too.